French food and wine are the heart and soul of France. French culture goes hand in hand with gourmet ingredients, rich aromas, and unique textures. To be a chef in France is to excel in niche specializations that distinguish a bread pastry chef from a macaroon pastry chef. At the first stop on this self-guided culinary and food walking tour of Paris, you’ll bite into a traditional French croissant and you’ll know why Parisians are known for the food expertise. The warm flaky layers crunch with the first bite, then the buttery layers melt into your mouth while the bar chocolate seeps and hides in the delicate folds. So, what better way to spend a full day in the foodie metro than on a Paris food and culinary walking tour that is self-guided so you can taste those croissants for yourself. To eat as a Parisian is to eat 5 meals a day. Breakfast, mid-morning snack, Lunch, Gouter (which is often just for children out of school) and dinner. Lunch and dinner in Paris are often course meals, or what is called a “menu” in France. If you dine at a restaurant and you choose a menu, be prepared for several courses including appetizer, main dish, and dessert. Dinner is traditionally consumed as a family with home cooked food and a baguette from the local bakery. Most consumers in the U.S have loyalty to the brand, such as Starbucks, but in Paris, the loyalty is to the chef or baker themselves. Many Parisians form a close-knit bond with the local butcher or baker and will follow them if they move shops. French food is kept to such high standards that regulations dictate how to make a true baguette or cheese. It’s all so bizarre to me hailing from the U.S where a book called “The Jungle” was written about our food industry. In line with the traditional 5 meals a day, our tour will make 5 main food stops with some extra activities, like a wine tasting added in. This Parisian food tour covers a lot of ground in the city, so be ready to work up an appetite, use the Metro as needed and stop along the way to see your favorite sites like the Eiffel Tower! 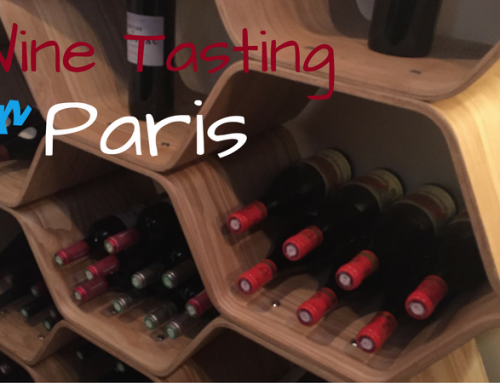 The second to last stop on our tour is in the Latin Quarter with the “Wine Tasting in Paris”, which starts at 5 pm. This activity needs to be booked in advance and runs Tuesday, Thursday, and Saturday. So budget your time accordingly and try an alternate wine tour if you’re in the city on a different day. The map below can be used as a reference for our stops. This post contains affiliate links, by selecting a tour using one of the links in this post I make a small commission for completed booking. If self-guided tours aren’t for you, I appreciate you using my link to book any foodie tour of Paris, it helps support this blog. Our self-guided food walking tour of Paris starts around 8:30 am at Blé Sucré for real French croissants. Those flaky melt in your mouth croissants I was talking about earlier. The French croissant is so complicated and laborious (about 15-20 hours) to make that it is hard to find freshly baked croissants anymore. Even in Paris croissants are often made in bulk, frozen and shipped to bakeries. Blé Sucré is one of the gems that hand bakes croissants daily. In the morning you can find a line outside the tiny bakery with those eager to get their fresh baked breakfast. The chocolate croissants at Blé Sucré are made with special bar chocolate that only melts at a high temperature, so the crunch of the chocolate explodes into the layers of the bread as you bite in. Order the plain and chocolate croissant with some coffee to drunk them in and you’re set to start the morning. You can get several different items here, including sweet pastries, but we will save that for later. Paris is known for their food markets and one of best and biggest is the Bastille Market, so of course, we will be stopping there on our food tour of Paris. With the Place de la Bastille’s Colonne de Juillet towering as a backdrop, grab a knapsack and get ready to shop over 100 booths of fresh French cheese, veggies, meats, and seafood. Since this isn’t our lunch stop we’re going to eat lightly and I’ll suggest several different types of meats and cheese to take on a small picnic. The market can be rather crowded and chaotic, but relax and enjoy the culture. Most vendors speak some English and are very friendly. Feel free to buy anything that takes your fancy, but make note that with some gentle light humor most vendors will let you try samples, just tip them a few coins. You should get to the market around 9 am and you could easily spend between 1-2 hours here. EDIT: I am now a vegetarian. I am choosing not to edit this post because meat is a large part of the culinary experience in Paris. However, there are plenty of vegetarian options – if you look. I suggest grabbing olives, fresh fruit, veggies and baguettes to take on a picnic. At any of the cheese stands pick up 50-100 grams (each) of Comté, Reblochon, Roquefort, and Camembert. Comté: Probably one of the most famous and heavily AOC regulated French cheese, this can come in several different varieties. Comté Extra is the highest quality and can often be expensive and hard to find. Don’t get caught eating the thick rind on this complex cheese, the taste is better with no rind! Reblochon: With all the regulations on pasteurization in the U.S this cheese is almost impossible to find as it is made from raw real cow’s milk. Produced in caves and cellars near the French Alps it has a soft interior contrasting to the thick rind. This cheese is very rich with a nutty creamy flavor. Roquefort: This is a sheep milk based blue cheese. With no rind, this cheese crumbles with a salty finish. This is another cheese produced in French caves and only certain caves can claim Roquefort as a name. So, it’s rare and complex. Camembert: Similar to a Brei this cheese is actually almost watery in the center. I made the mistake of purchasing real french Camembert assuming it was the same as others. It smells up the fridge rather fast. It also has a strong taste to match the flavor, but it’s really rather pleasant! Jambon de Bayonne: Traditionally made near the Pyrenees the regulations surrounding the breed of pig down to what they eat are very strict. Cured and dried for up to 20 months you might expect to find it salty, but the only flavor that comes through is a hint of sweetness. Duck Rillettes: You may have had duck confit before and if you enjoy it then don’t miss this dish. It is duck that has been cooked as confit and then shredded with spices added. It is the best spread on a baguette. Saucisson Sec: This French sausage is dry-cured and can have some very interesting ingredients added to the mixture. Peppers, garlic, orange and other fruits, spices, nuts… etc. This is a good time to sample some pieces before choosing one. Even baguettes are regulated in France. They must be a certain weight, size, and type of grain in order to be classified as a true French baguette. So, grab one on your way out of the market to get ready for the mini picnic. It’s time to take your loot to a park and have a mini picnic. I pinned Square Du Temple on the map as a suggestion, since it is close by but head wherever suits your fancy. French gardens are numerous and very enjoyable for a nice picnic with your French food. Lunch is across the city, so you might have worked up an appetite by the time you get across town, if not you can actually walk under the Eiffel Tower stopping through to look at it. If you want to do the whole tour and plan on waiting in line for hours, today isn’t the day to do it. But I was able to walk through take some great photos and enjoy the structure on my way to lunch. 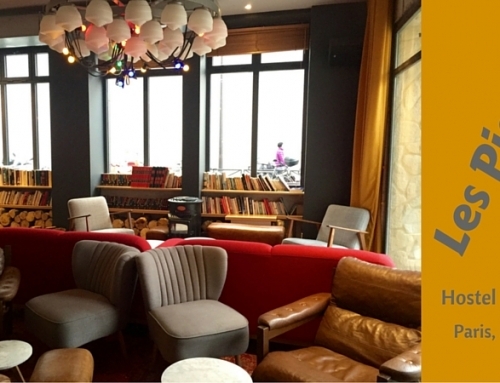 A French Café is our lunch stop on this food and culinary walking tour of Paris! You may have noticed that you can spot a French Café by the wicker chairs outside and typically red awning. With so many options, how do you choose? I have found that food is better on the outside of the inner circle. The inner circle of Paris tends to be more touristy and overpriced. So, my pick for lunch is near the Eiffel Tower just outside the inner circle. Feel free to peruse the options, but I recommend Kleber. It was a spacious and cozy Café with delightful service and amazing food! I suggest trying a Croque Madame, which is a traditional French food. Looking to class up your lunch, try these lunch and wine tasting cruises and options. Another alternate tourist stop on the foodie tour of Paris, this can be done another day if needed, but if the lines aren’t long you may be able to do this and the Eiffel Tower, but probably just one. We’re having dessert as a mid-day snack, judge us. This is it, what we’ve been walking and training for. It is time for traditional Parisian pastries. Since we skipped the sweet pastry for breakfast this is the time eat your heart out. I mentioned earlier that pastries are so unique in France, chefs go to school in order to specialize in the art of one or the other. Lenôtre is renowned for their sweet morsels. Grab whatever makes your taste buds water and head to the Latin Quarter to prepare for the wine tasting. If you’re looking to learn to make Macaroons or get up close and personal with a pastry chef try some of these recommended tours! This specific wine tasting is an absolute favorite of mine. I suggest giving yourself more time in the Latin Quarter to take photos if you want but make sure you are on time for your wine tasting. I wrote an extensive post covering this tasting. Read it here. A Wine Tasting In Paris. Remember this event starts at 5 pm in the Latin Quarter and runs for 2 hour, meaning dinner will be after 7 pm. Thierry, the owner of A Wine Tasting in Paris has great recommendations for dinner in the area that are just a quick walk from the tasting. If you are not in Paris during this wine tasting, I highly recommend booking one of these tours to enjoy a French wine experience and tasting. While Thierry, if you did the wine tasting will have many great recommendations for dinner, we went to Au Moulin A Vent based on his recommendation and were very happy with this traditional Paris dinner. I’m surprised we still had room for dinner, but after copious amounts of wine, we were ready to eat! Au Moulin is a cozy traditional restaurant. This means the tables are literally table to table, so your server will help you into your seat and out if you need to leave. They will come with a board and talk about your menu options as well. This is where you go all out on three courses. Start with the scallops or salmon tartar, and then choose your main dish of tasty seafood or steak (again I am now a vegetarian and encourage you to eat seafood or veggies :)) If you’re feeling wild you can order the giant tray of salami. They charge you for whatever weight you consume. I rather enjoyed that my dinner, which happened to be on Valentine’s Day, included a bouquet of roses and a tray of salami. The servers were so delightful here helping us with the menu, joking with us and attending to our every need. This is a great upscale French dinner with a casual dining feel. If you’re looking for a less intimate dinner experience try one of these exciting options where you can see Moulin Rouge or cruise the river with dinner. After a FULL day of eating our way through Paris with a food and culinary tour, there’s no shame in either taking a taxi back to your hotel. Personally, I like to head out into the Paris nightlife to dance off the calories and start again! What are your favorite restaurants in Paris? Let me know in the comments. Looking for more culinary and food experiences in Paris, France, check these out. Don’t forget to pin this to your favorite foodie board! Okay I have so much to say I don’t know what to say! I am just super excited to have a specific map to follow when I hit Paris again. There’s a lot of food posts about Paris but there’s SO MUCH to eat in Paris so I read them all! That smoked salmon bagel though – YES. And that croquet madame (right? madame has the egg and monsieur doesn’t?) makes my mouth water. I love that you went to a food market too – those are my week spots traveling! Given that it is Paris though, how were the prices? Hey Lauren! Thanks for reading! I should go back and include prices, sorry I did not. I would say everything was within reasons on a sale of breakfast and the markets being $, Lunch at a nice Paris cafe is about $15 per entree. Dinner was a bit more pricy around $20 a plate. I’m really glad you asked. I’m glad I just had dinner, otherwise this post would make me starving! I know you can’t include all amazing French dishes in one post, but I definitely recommend an omelet and fries to anyone! Supreme! Will find and order those next time I’m in Paris! Michelle, let me know when you do! It’s such a huge city it’s always worth a second look! Wow that’s amazing! Such beautiful pictures!! Next time I’m in Paris (it’s only a 3h drive for me), I’ll visit some shops!!! What an amazingly detailed DIY guide! I love when I can get info to do tours on my own – it’s saves money and you get to do it at your own pace. Thanks for all the great information and you had great photos to compliment! Cheers! This is such an awesome guide, Susanna! I was so student poor when I visited Paris, so I didn’t really eat much, let alone focus on fine dining. I’d love to return and indulge in the full five meals a day mentality. You have seriously made me hungry with this post! I think I should have been a Parisian as I am quite prone to having five small meals a day lol. My favourite meal of the day is breakfast, and I adore freshly baked croissants and pain au chocolat. But I’m also a bit of a cheese addict so would love to checkout Bastille Market! The cheeses look amazing. OMG everything looks so good!!!! I haven’t been back in Paris in so long. I’m definitely bookmarking this for my next visit though! I’m already planning my visit!! The food looks amazing. This all looks so tasty! I have been told that one should book hotel without breakfast and enjoy all the little nice places Paris has to offer. Will be heading there in April for the first time, so I hope to do some bits of this tour! I completely agree with that. There’s so many amazing cafes all around that you don’t have to go very far to find a good breakky. All this food looks so delish! I am dying to see Paris! What a fantastic share! All of the stops sound great, even for repeat visitors. I love your breakdown of the French cheeses! Well done! I’m only kind of obsessed with French cheese, it’s so good. Thanks for reading! I could really use a croque madame right about now! One of these days I hope to eat my way through Paris like you guys did 🙂 Also, so funny that they have standards for baguettes! Guess the French take their carbs seriously. They have standards for everything haha. Sometimes I feel like it takes the creativity of things, but they do baguettes well, so you can’t go wrong. Thanks for reading, Flo.